Decorative register covers made by Urban Registers are handcrafted and custom made on every order. These aluminum floor registers will not rust, so they are perfect to use in bathroom or kitchen areas which have high levels of moisture. 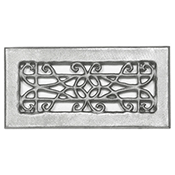 The decorative register cover comes in the bare aluminum finish and can either be painted or left as is. Once painted, it is considered a non returnable item. If the aluminum floor register is left in its bare form, it may oxidize over a longer amount of time. The decorative register cover includes an attached steel damper which adjusts to allow air in and out of your space. Make sure to order aluminum floor registers with the damper at time of purchase because it is not recommended to retrofit at a later time. Our decorative register cover is perfect to use in both heating and cooling needs. Order your aluminum floor register to come with screw holes if you so desire. Otherwise, the decorative register cover will easily install into your floor by just dropping into your duct opening. Reinvent your space both indoors and outdoors with these aluminum floor registers which will revamp your style. Urban-86 8 x 6*** 9 3/4" x 7 3/4"
Important: The aluminum floor registers can be painted if you so choose but then cannot be returned. If left bare, has the potential of oxidizing. Because the decorative register covers are made to order, it can take between 3 to 4 weeks to ship. 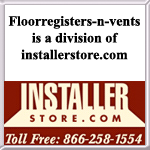 Tip: To properly order aluminum floor registers, you must measure your floor hole opening and not an existing floor vent. The 10 x 4 decorative register cover will drop into a floor opening of 10 x 4 inches. The faceplate will measure slightly larger and is located in the table. The thickness of the faceplate is approximately 1/4" and the damper drops in approximately 2". While these aluminum floor registers are meant for floor use, there are decorative register covers which can be installed on your wall or ceiling. Order your floor registers with us to get them shipped straight to your door!